The girls track team poses for a picture with their team runner up trophy. 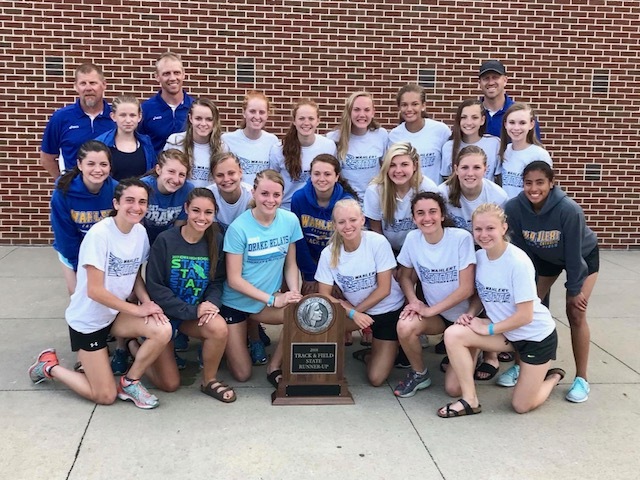 The Wahlert girls’ track team continued its legacy on the blue oval at the state track meet this past weekend in Des Moines. They placed second overall, setting two new state meet records and bringing home three state championship individual and relay team titles. A force to be reckoned with, all weekend the Eagles stayed neck and neck with Pella fighting for the first place team title, which came down to the last day. The girls qualified for the open 100, 200, 400, 800, 1500, sprint medley, 4×200, 4×400, 4×800, high jump, long jump, and discus. Aliyah Carter won the girls’ class 3A long jump with a jump of 18’, 00”. The 4×100 and 4×200 relay teams, consisting of Bailey Hasken, Anna Sherman, Libby Wedewer, and Clare Broderick both took home first place finishes and both set new meet records. .
“Winning those relays and setting the records feels so awesome,” said Sherman. “We wanted to win the races but setting new records just makes it that much better. We’ve trained so hard for months and the reward came,” said Sherman, ‘18. Broderick added, “It felt really cool knowing that our relay records will be there and that will be a goal for other teams to break,” said Clare Broderick, ‘20. The distance medley relay team finished third overall, gaining a few more points for Wahlert on the final day. As the day continued and time ticked down to who would take the trophy home, the sprint medley relay team was up to battle. Unfortunately, the team was disqualified for a line violation. “It is frustrating when things like that happen. Sometimes you aren’t even aware of what happened until the race is over. You step on a line one too many times; it is a really small thing, but it can make or break a relay,” said Sherman. The 4×800 team, consisting of Ellie Osterberger, Kaylee Osterberger, Holly Hohmann and Aunna Huseman, finished second with a time of 9:30.4. Then, the Osterberger twins and Hohmann joined with Molly McDonald to place fourth in the 4×400 in a time of 4:04.8. Those finishes put a few more points on the board to keep the race to the top close. Although the team fell short of its overall goal of a championship, the class of 2018 has continued its tradition of hard work and success within the women’s track program. Many of the graduated seniors have been running at Drake and state since their freshman year. “We’ve left our mark on the program. We led the workouts and set examples of hard work and dedication for the younger girls. But most of all, we left our mark not only as athletes, but as people,” said Ellie Osterberger, ‘18. Sherman agreed with Osterberger that they have made an impact not only on the program, but on the returners for next season. “We have been led by other amazing leaders in the past, and I think we showed the underclassmen how the hard work pays off. I’m really excited to see what the future holds for this program. I think they will be strong leaders in the coming years,” said Sherman. The entire group of seniors took part in three third place finishes and a runner-up this season, their last season, running together after they had grown so much with each other throughout the past four seasons. “Being at state for the last time was a little heart-breaking for me because I know I’ll never run again with the same teammates, but I’m also really glad I got to experience everything with them,” said Osterberger, ‘18. The 4×4 team you listed is incorrect! Thanks for bringing that to our attention. That part of the story should be accurate now.